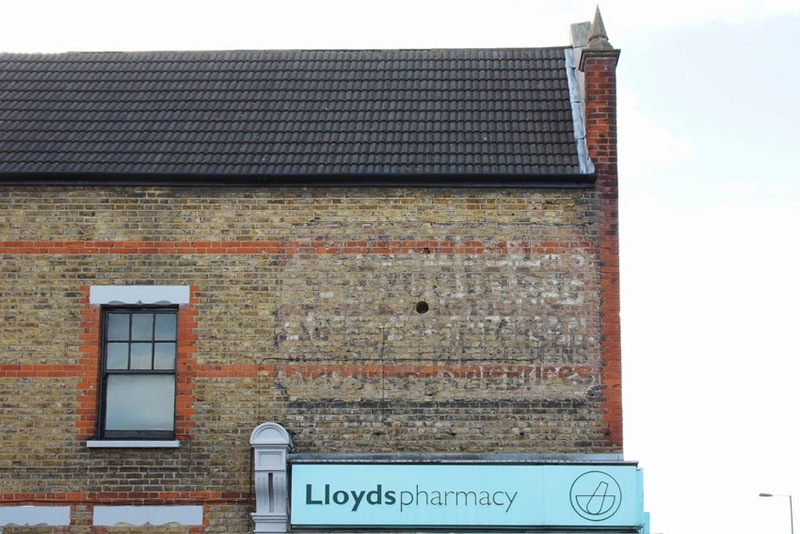 Taking the 124 bus from the Excalibur Estate, I travelled along Sandhurst Road, Catford for the first time and found three ghost signs. The first, on the corner with Muirkirk Road, shows that the barber's/shipping agents used to be a butcher's shop. More precisely, it was 'R. C. Evans, Family Butcher, Purveyor of English & Scotch meat, finest quality, lowest prices'. 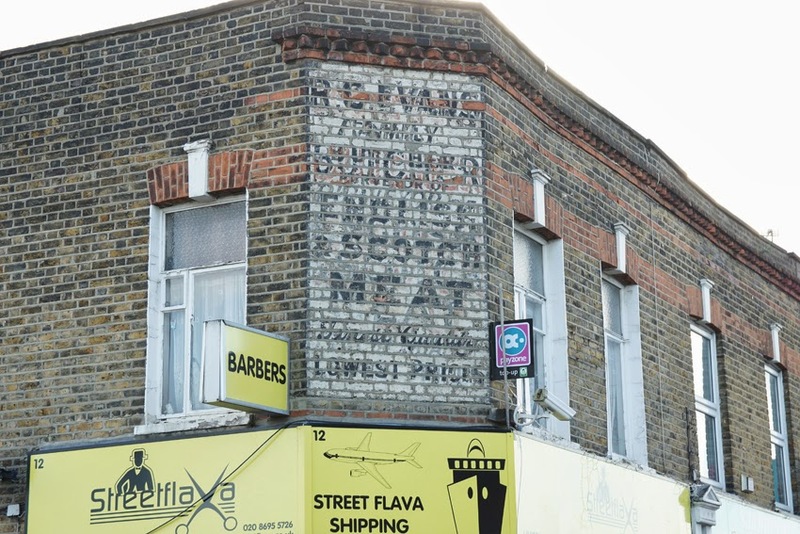 Evans appears to have occupied the premises long enough for the sign to have been repainted at least once: traces of the earlier lettering show through. Nearby Inchmery Road has two signs. The first, sadly, is near-illegible although tantalising traces of the words remain. However, the second was rather more exciting. 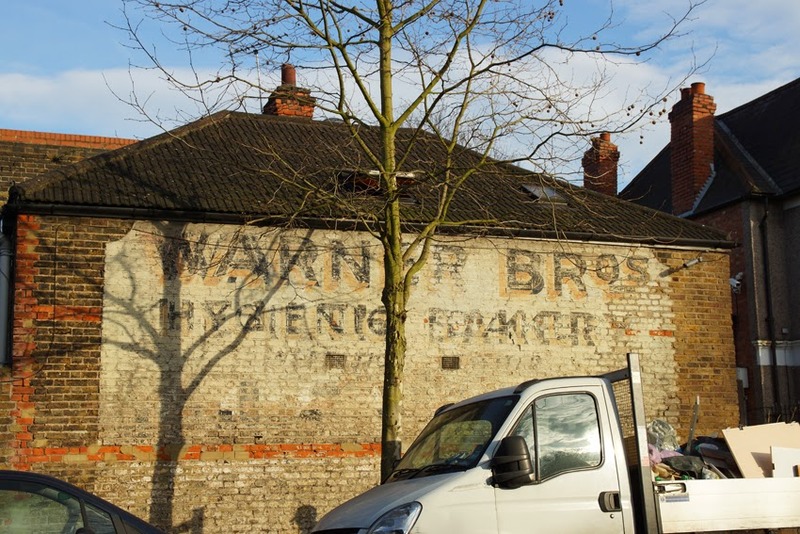 From Sandhurst Road, a large sign for Warner Bros, Hygienic Bakers is visible. 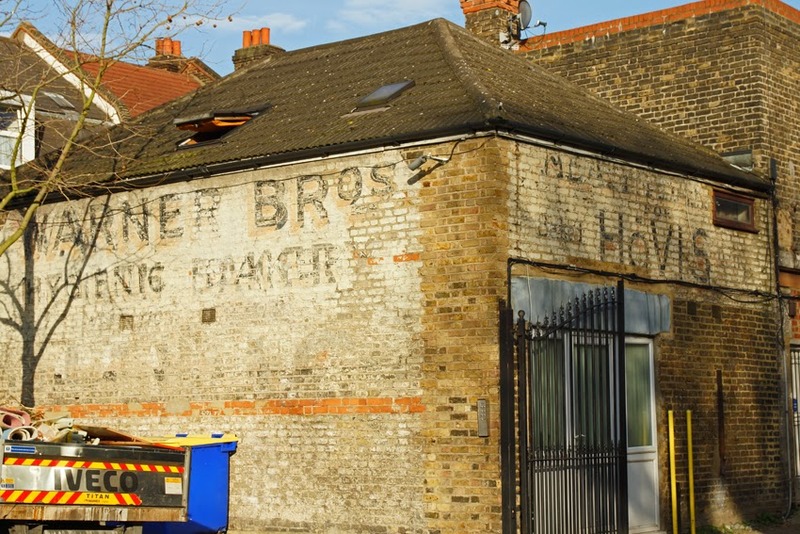 Walking down Inchmery Road, though, the side of the building revealed that this building also advertises Hovis. 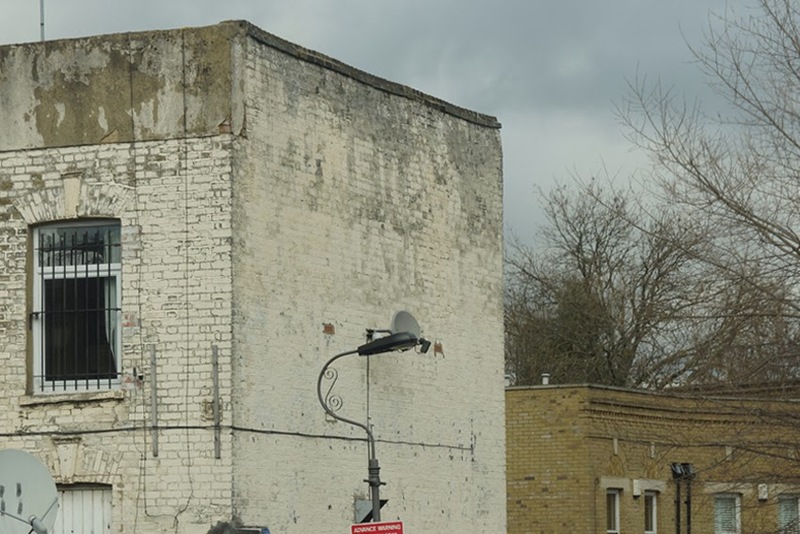 The use of the Hovis logo in conjunction with details of a local baker was characteristic of their campaign, but it's the first one I've seen making use of two walls of a building in this way. 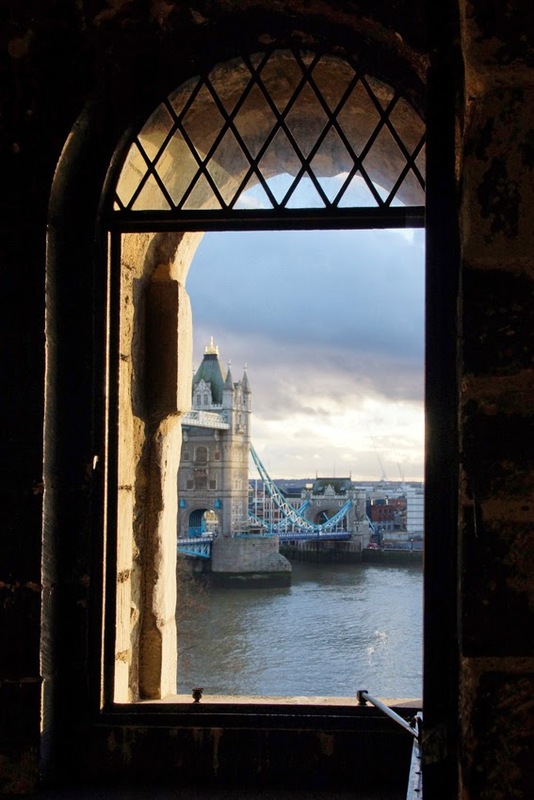 Tower Bridge is one of my favourite London buildings, and the views from its walkways over the Thames are some of the loveliest in the city. It was, then, a special treat to be there at nightfall earlier this week. 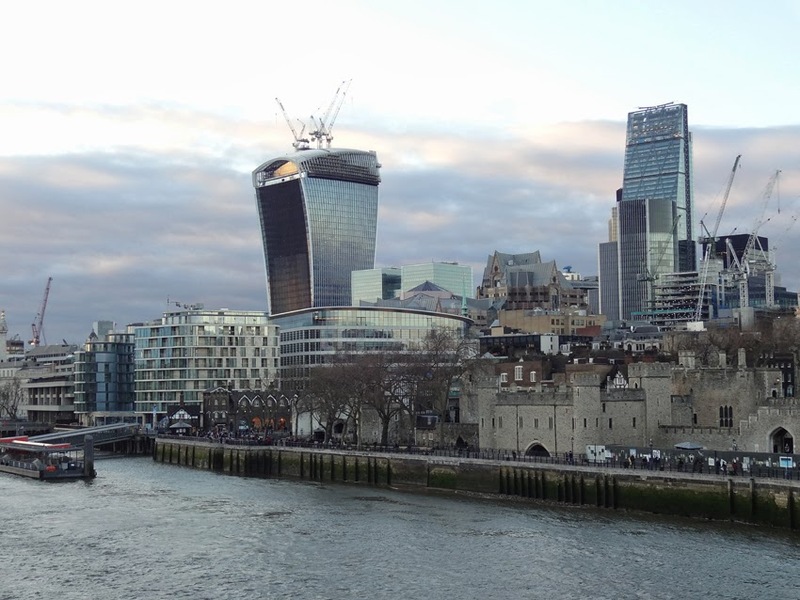 I wasn't only there for the views, however; this was the launch of the City of London's new City Visitor Trail. 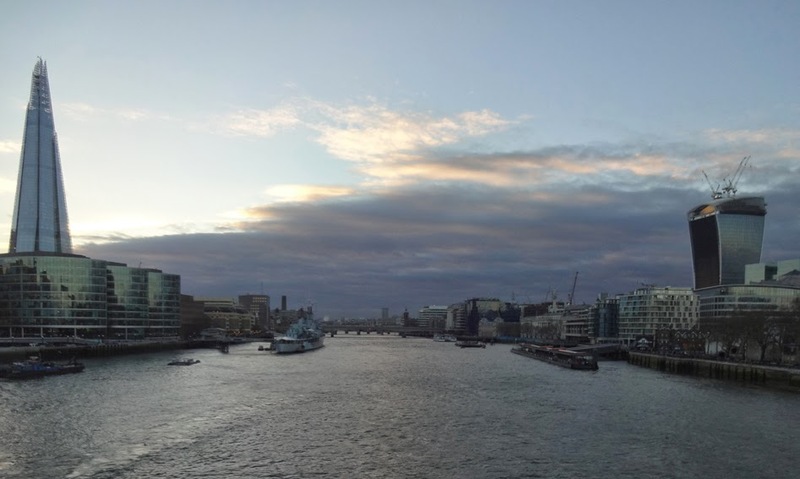 If you'd like to explore in the company of guides such as the Head of the Guildhall Library, a Pearly Queen, and the Chief Yeoman Warder, the video stories in this app lets you do just that. If you want to be side-tracked on themes from sculpture to the law, there are options to extend your exploration. And most practically, the app even locates the nearest toilets! It's accompanied by a print map - and a children's trail map, which includes stickers. 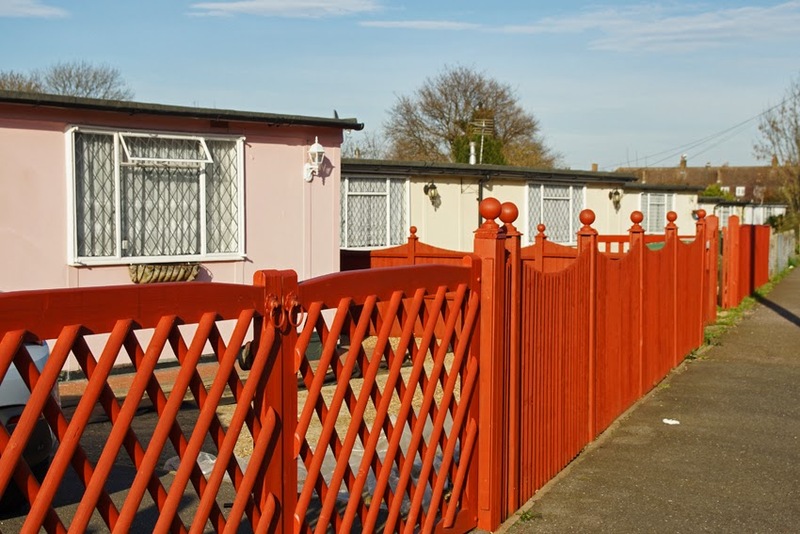 It's Britain's largest surviving prefab estate - at least for the moment. 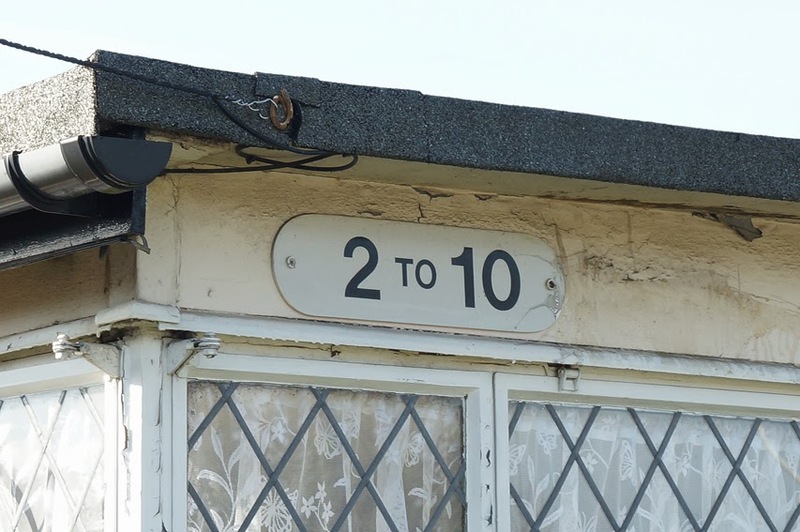 The Excalibur Estate in Catford was always designated 'temporary housing', and has been under threat of demolition in recent years. However, many of its residents remain attached to their prefabricated homes, and unwilling to leave them. 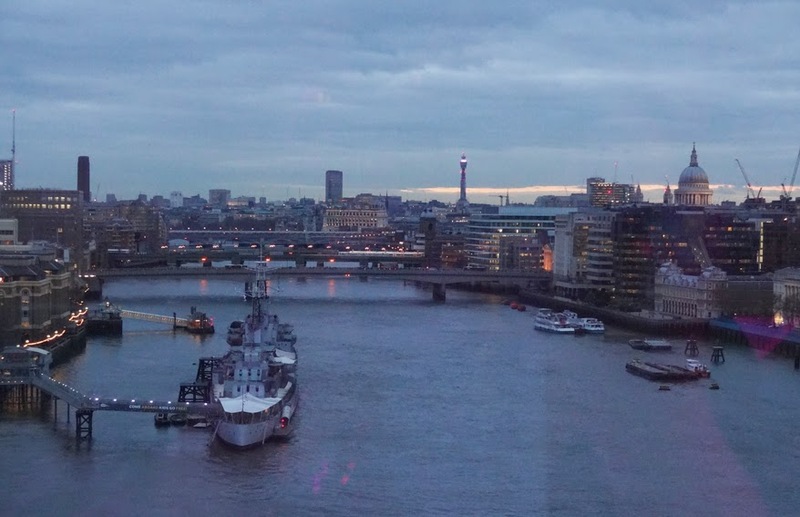 As World War II progressed, it was obvious to the government that one of their most urgent post-war tasks would be to replace the housing lost to bombing. With resources scarce after years of war, and homes needed as soon as possible, how could this be achieved? The answer was prefabrication: in the two years after the war ended, temporary housing was quickly erected, mostly by German and Italian prisoners of war. 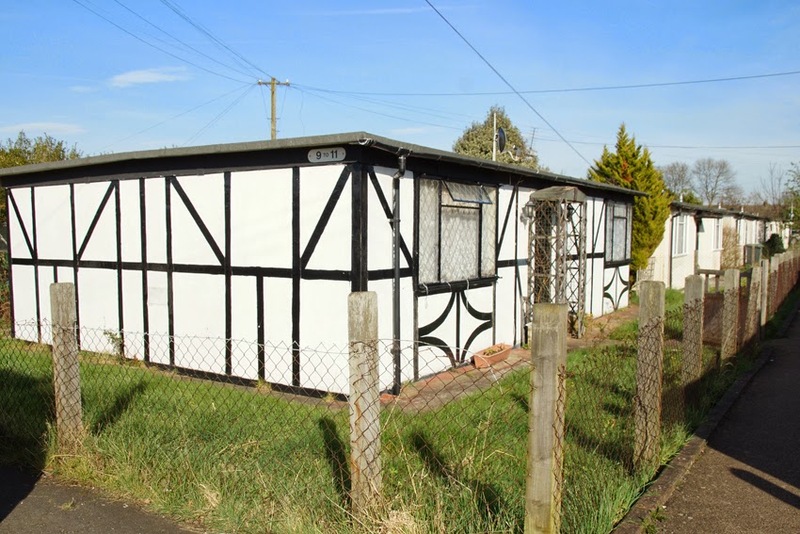 The timber frames and asbestos sheeting were produced by factories previously busy with war work. The estate is made up only of houses: in the rush to accommodate families, no space or materials were spared to construct other amenities. 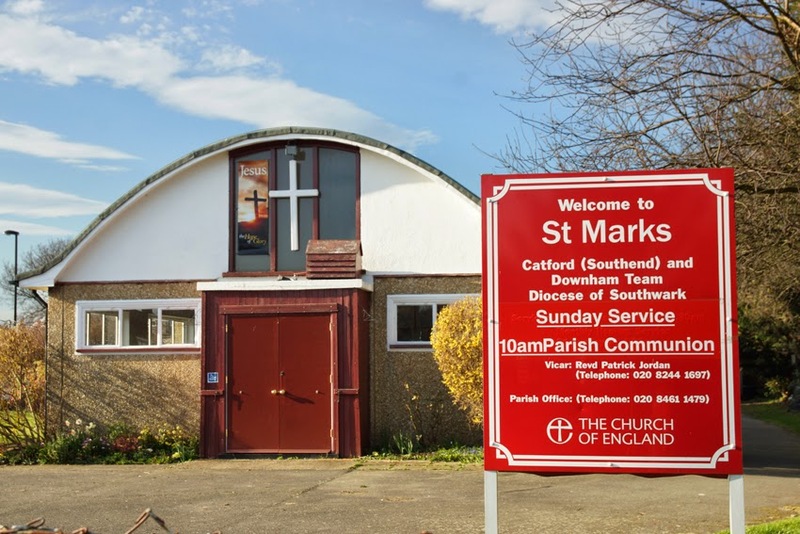 The exception is the church at its edge, St Mark's, itself an unusual construction from the 1960s which feels entirely appropriate for its context. 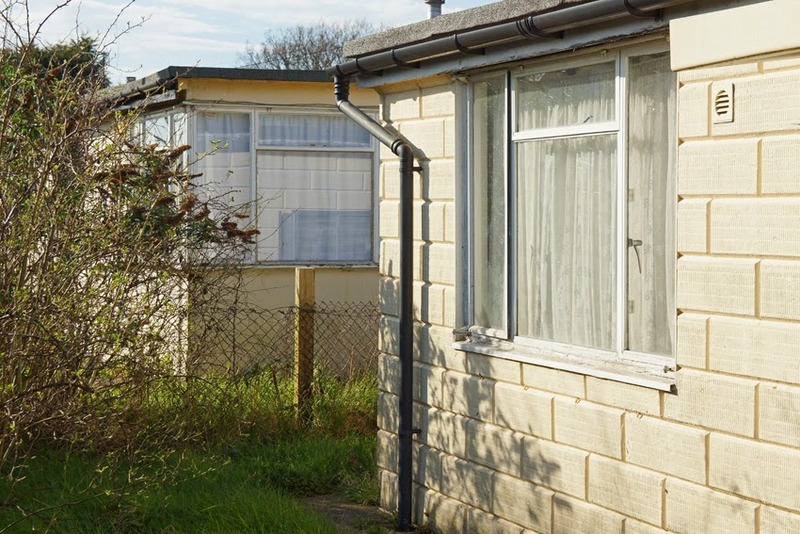 Although designed to last for just ten years, the housing offered rare luxuries to its working-class occupiers: indoor toilets, bathrooms and refrigerators, as well as front and back gardens. 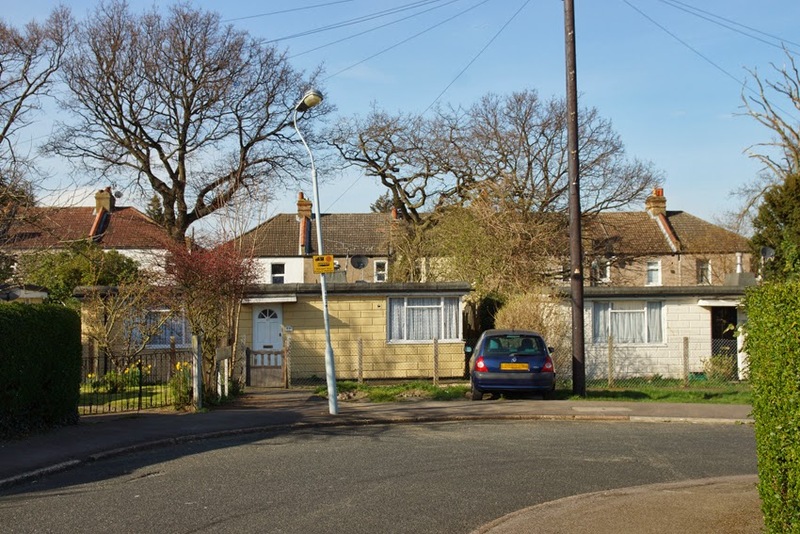 It is unsurprising that many became fond of their detached, two-bedroom bungalows and stayed long beyond the expected decade: at least one resident has been here since his house was new nearly seventy years ago. Under the influence of their occupants, the homes have developed their own characters, adding to the estate's charms. The affection is not universal, however. 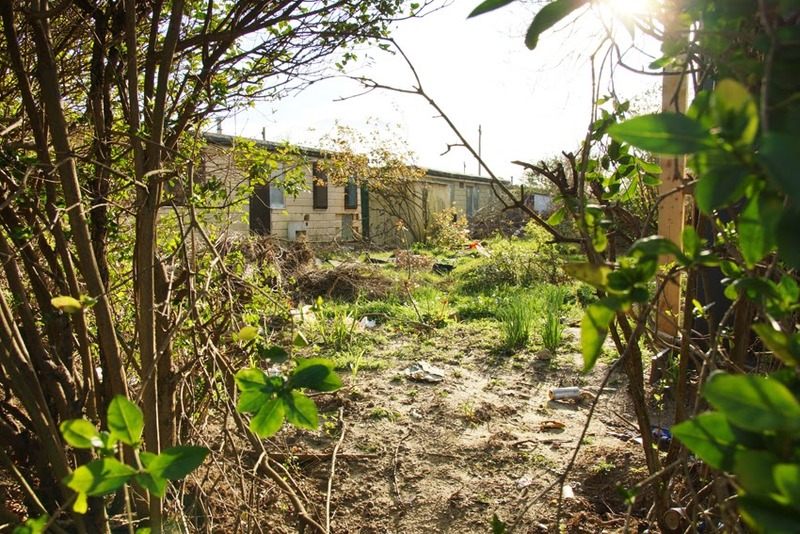 From the council's perspective, these homes will be difficult to maintain and bring up to modern standards, while they are exceptionally low-density (being detached bungalows with generous gardens) in an area with a high number of homeless families. 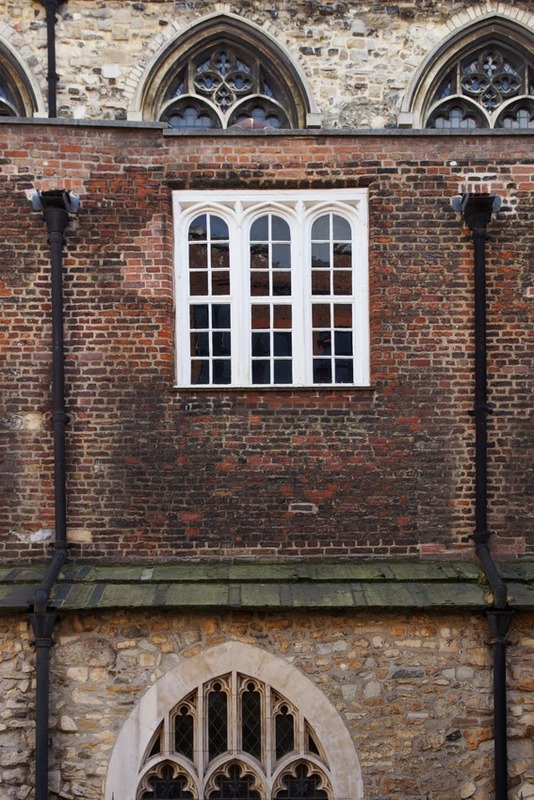 For some residents, they are damp houses without double-glazing which would be better replaced by modern dwellings. Other residents are determined to keep their unusual homes. They point to the roomy and convenient layout, the peacefulness and community spirit of the estate with its quiet paths and friendly neighbours, and the social history that the Excalibur represents. 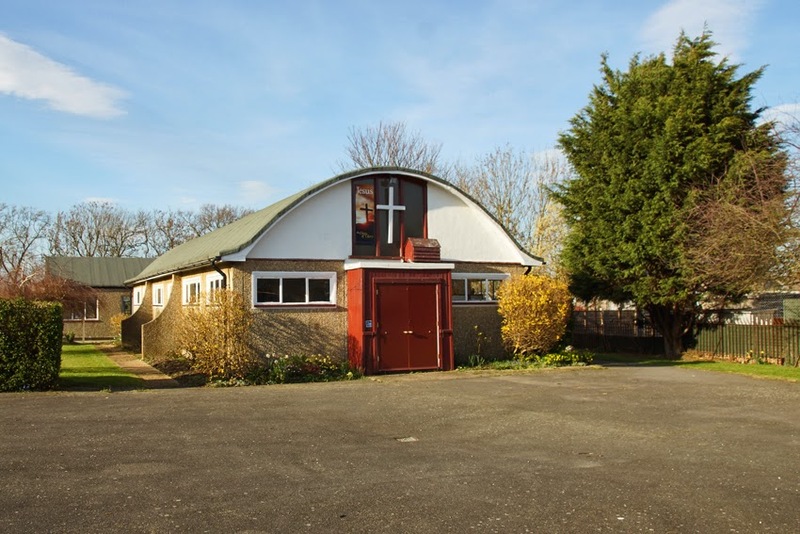 The latter point has been taken up by the Twentieth Century Society and by English Heritage, on whose recommendation six of the homes have been listed. The rest of the houses remain under threat. 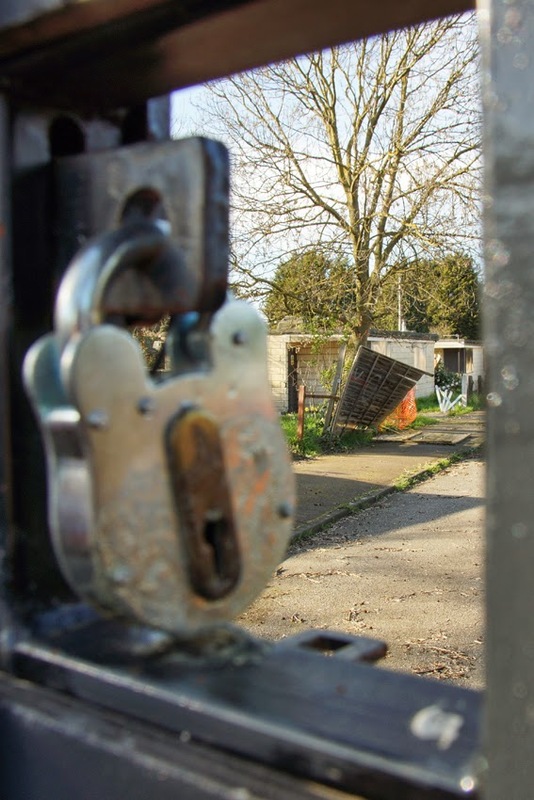 Some are already empty, their residents moved elsewhere, and part of the estate is now closed off by high fences and locked gates. A visit to the estate poses all sorts of questions. It offers a vision of social housing which was designed to offer a high standard of living to its residents, very different to most of the developments springing up in London today. It is a piece of social history, too, as well as a living and functioning community; shouldn't we preserve this as diligently as we preserve more glamorous, less working-class buildings? Can six houses alone, devoid of the context of the surrounding estate, adequately represent that history? At the same time, these houses were not built to last indefinitely: can the costs involved in maintaining and improving them be justified? Indeed, can investment in such low-density housing be justified when the pressures on accommodation in London are so great? (Lewisham Council and L&Q housing association's proposals would see the number of homes on the land doubled.) What will be the quality of the new homes? The trouble is, if Lewisham Council have got the answers wrong then there will be no way to replace this unique estate. 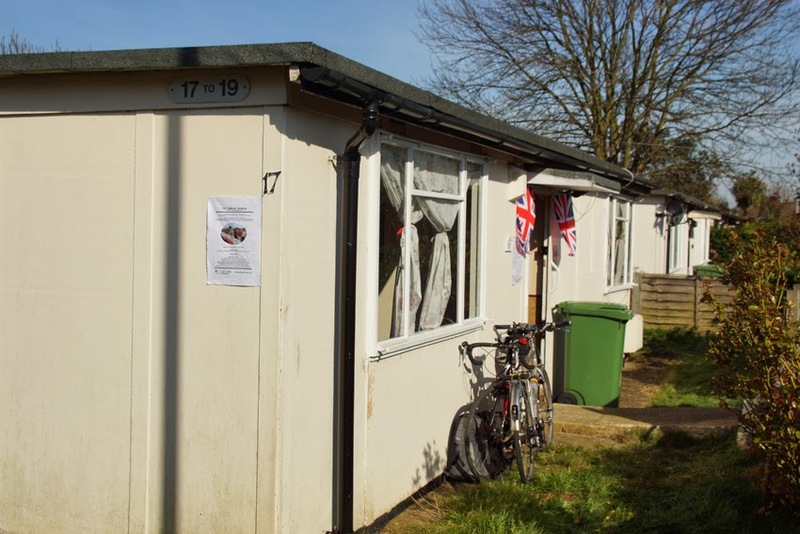 If you would like to explore the Excalibur in person, a prefab museum is open until 1 April, the creation of photographer Elisabeth Blanchet who has been documenting life on this and other prefab estates. Housed in one of the prefabs are artefacts, information, films and artworks; it's also a social space, with memories shared and new information added (a few days before my visit, one of the residents had brought in wartime newspapers found under their lino). It's open on Tuesdays and Thursdays, 10-4.30 and Saturdays, 10-6, at 17 Meliot Road, SE6 1RY. The Londonphile has also visited. 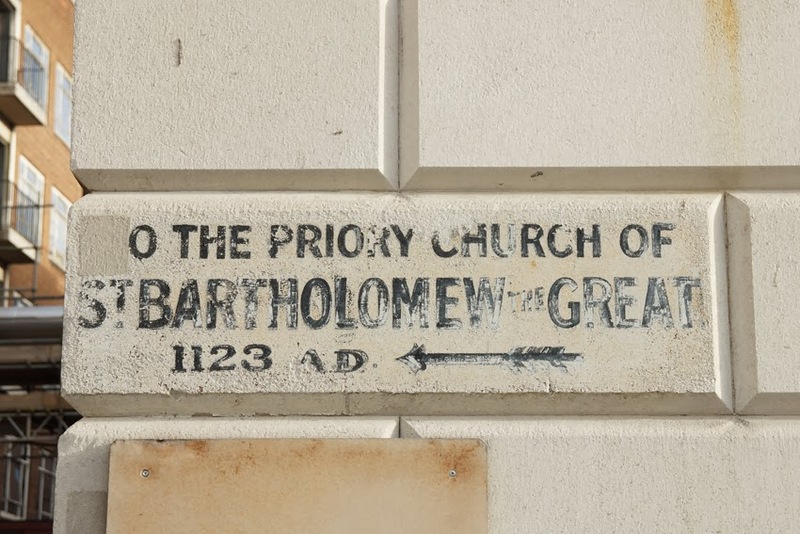 St Bartholomew the Great is, perhaps more than many churches, visibly a palimpsest: changing uses, contexts and fashions are written, rewritten and overwritten on its building, inside and out. 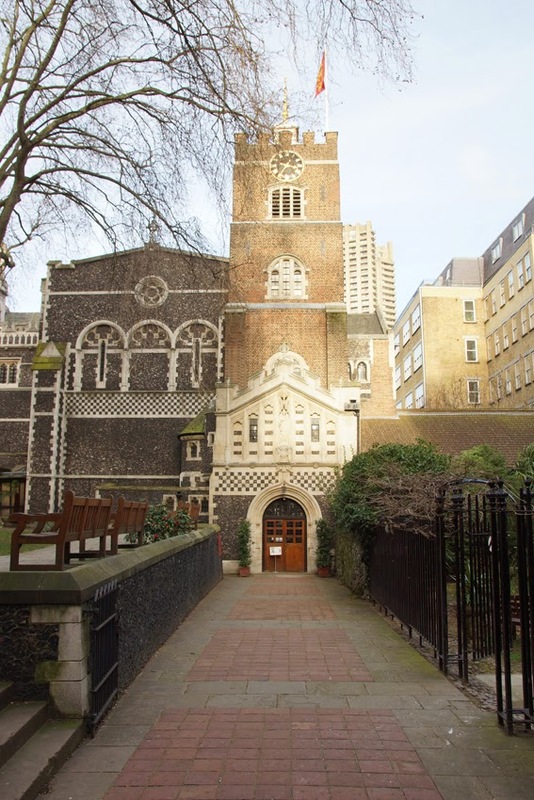 In 1123, St Bartholomew's was founded by Rahere as the church of an Augustinian monastery (alongside the hospital and its smaller church, St Bartholomew the Less). Buried here, he has a tomb to the west of the altar, built in the sixteenth century. 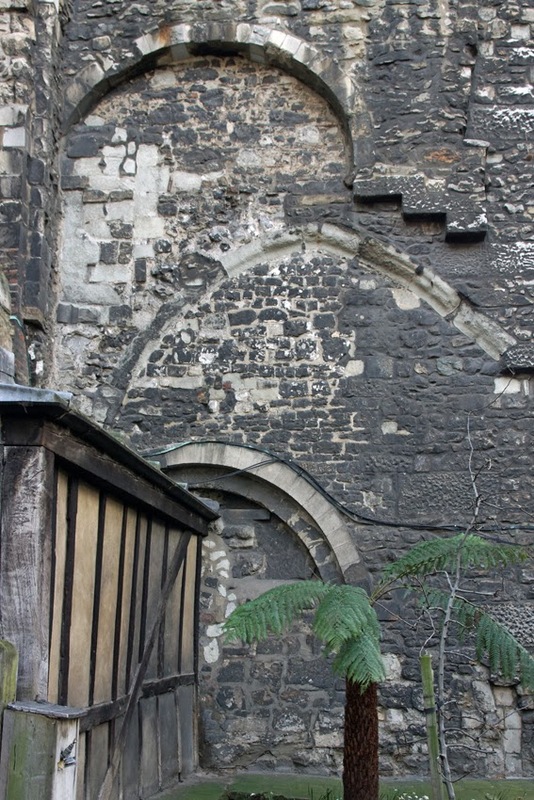 The church's east end was altered by the Bishop of London in 1405: the circular wall was dismantled and its materials used to construct a new, square east wall. 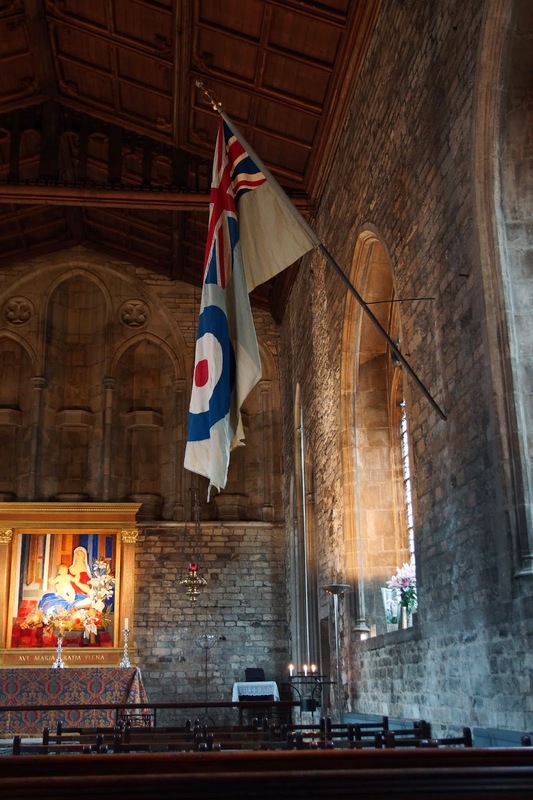 He also built a new chantry chapel and clerestory; further fashionable changes might have followed, had he not then died. 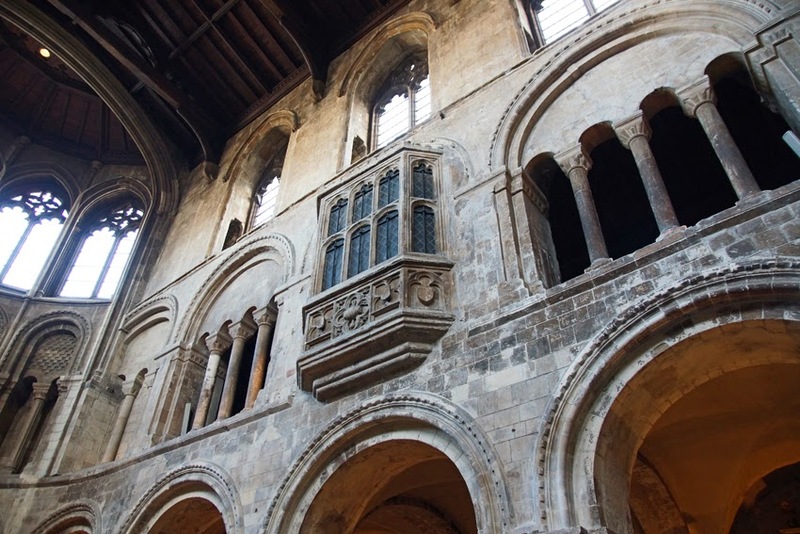 A century later, an oriel window was inserted into one of the southern arches. It bears the rebus of its creator, an arrow through a barrel ('bolt' plus 'tun', for Prior Bolton). 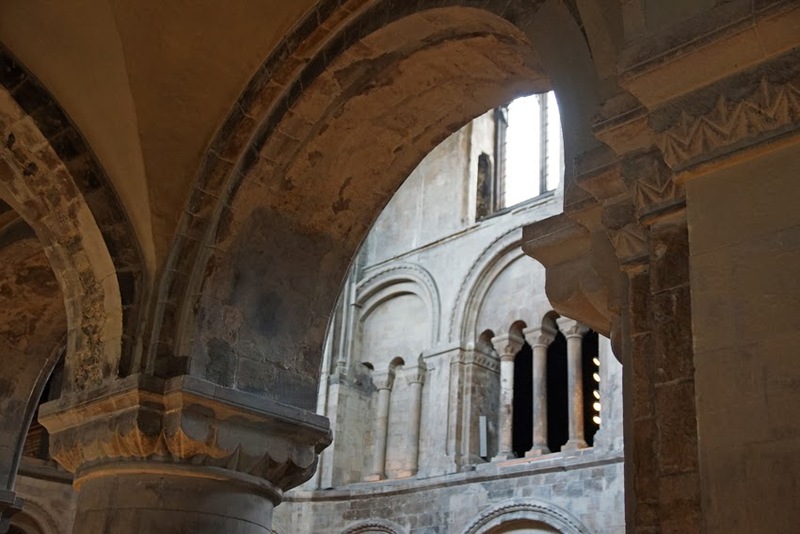 Like most such institutions, the priory was dissolved in the Reformation; the church's nave was demolished but the choir and sanctuary became a parish church. 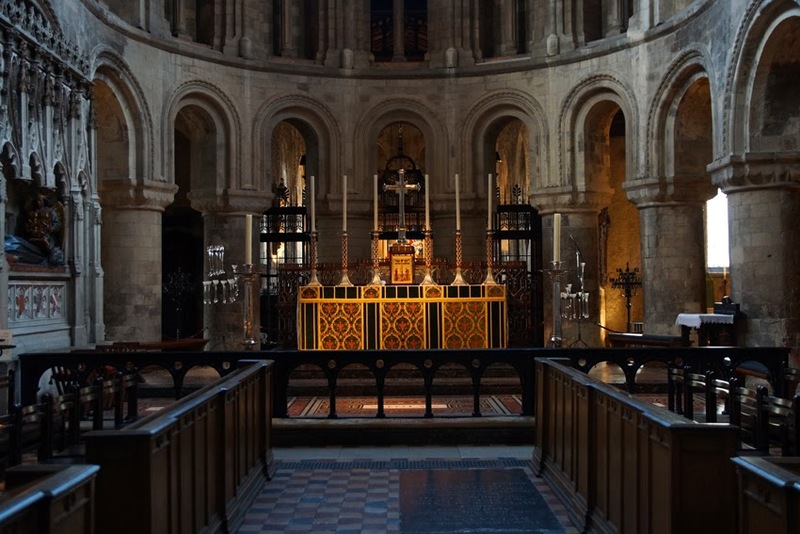 When Catholic Queen Mary was on the throne, priors (this time, Dominican) returned but under the Protestant Elizabeth I, St Bartholomew's became a parish church once more. 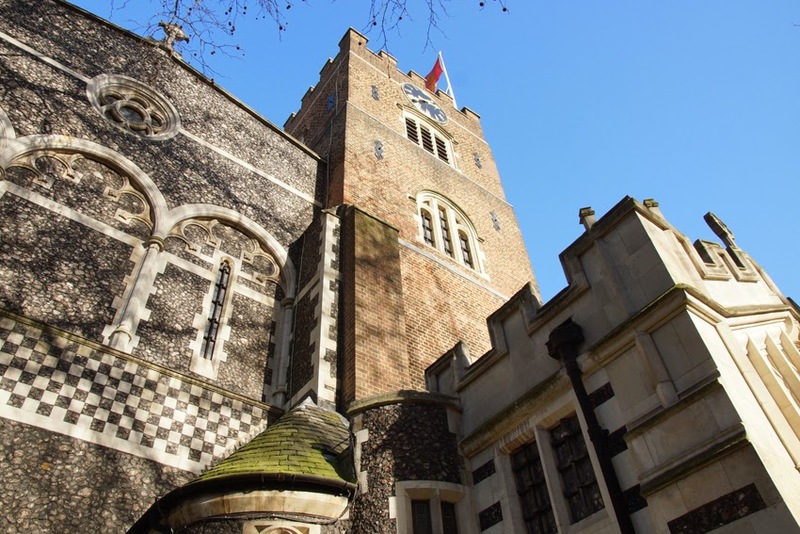 The tower was rebuilt in 1628; the church would survive the Great Fire of 1666, and William Hogarth was baptised there. The eighteenth century, though, was a time of decline with the church occupied by squatters: parts were used as a blacksmith's forge; hops were stored in the sacristy and coal in the crypt; the printer's office in the lady chapel employed Benjamin Franklin in 1725; while a fringe factory occupied the triforium until it could be bought out in the mid-nineteenth century. By 1809, there seems to have been a proposal to pull the church down. Unsurprisingly, it needed restoration in the nineteenth century (first by William Slater and then by Aston Webb) and again in the inter-war period. All this history is inscribed in the fabric of the church. 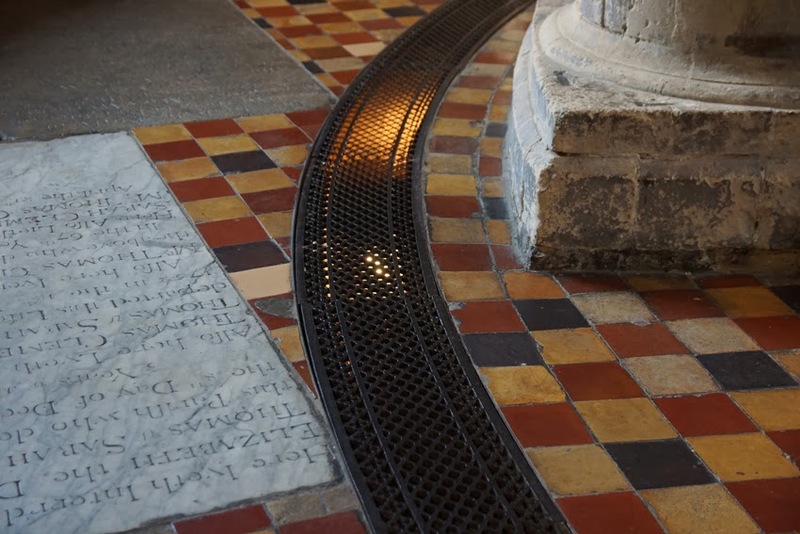 Norman arches stand amongst tiles in geometric patterns, disrupted by eighteenth-century tombstones. 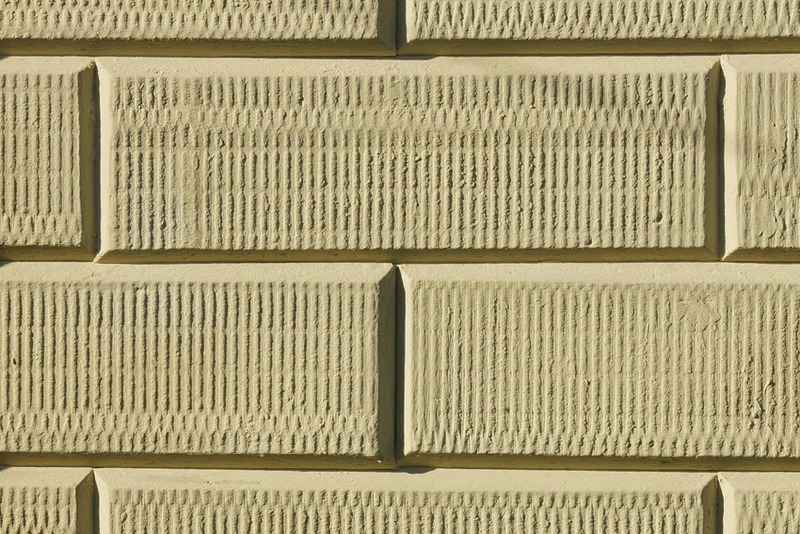 Fragments and traces are visible in stonework. New painting glows on an old chapel wall. 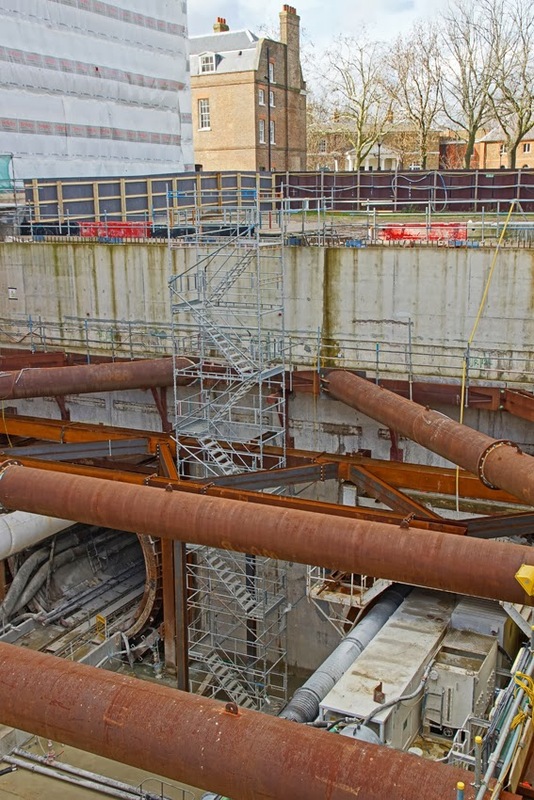 The huge Crossrail project, which is digging up or under much of London in order to create a high-frequency, east-west railway, has reached its halfway point. To celebrate this landmark, several stations opened to the public recently. I took the opportunity to view the construction at Woolwich Arsenal. It was a chance to see the development effectively in cross-section: a view which will disappear when the station gets its roof. Below ground level, the tunnels can be seen - and the back of Tunnel Boring Machine Mary. A concrete slab will cover the station at ground level and provide a base for a building above. It will sit among the historic Arsenal buildings, still visible in our picture. The geology of the area - chalk, flint, and wet ground - means that the TBMs are not, like the majority, earth pressure balance machines. Instead, they are slurry machines: the cutter head has a pressurised chamber, with a pipe feeding in bentonite (a clay and water mixture) to support the excavation face. Another pipe carries out the soggy spoil (in contrast, the pressure balance machines transport spoil back using a conveyor system). The 'slurry' is then treated in Plumstead, where it is separated out into sand, gravel, water, and 'cakes' of chalk. Seeing all this activity, and the advanced stage of the work, it is easy to forget that the station had a precarious start. Not part of the original Crossrail scheme, it was only added when Berkeley Homes agreed to build the station box as part of their development of the site. However, uncertainty remained until funding was agreed to fit out the station in July last year. 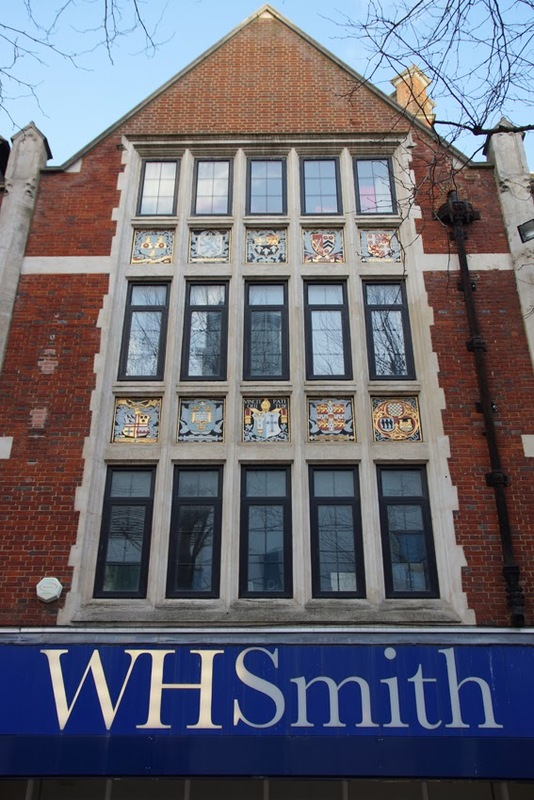 W H Smith may have settled for a rather uniform, corporate look today but their earlier shops had interesting and unusual facades. The North End, Croydon branch was built in Tudor revival style in the 1920s. Its exuberant and eclectic heraldic symbols share the same sort of approach as the (very different) decorations in Weston-Super-Mare. The heraldic shields on the upper row refer to public schools. They are, from left to right: Rugby School, Harrow School, Eton College, Winchester College, and Wellington College. The lower row alternates local references with the universities of Oxford and Cambridge, perhaps in an attempt to flatter Croydon as a learned town? 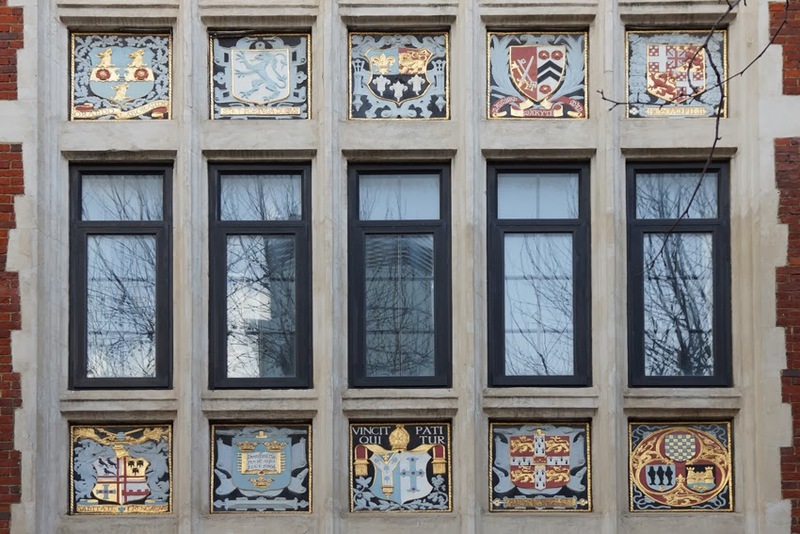 The arms are, from left to right, those of the Borough of Croydon, the University of Oxford, Archbishop Whitgift (founder of Croydon's Whitgift foundation), and the University of Cambridge. The final panel, with three heraldic shields surrounded by lions, has assorted local connections. 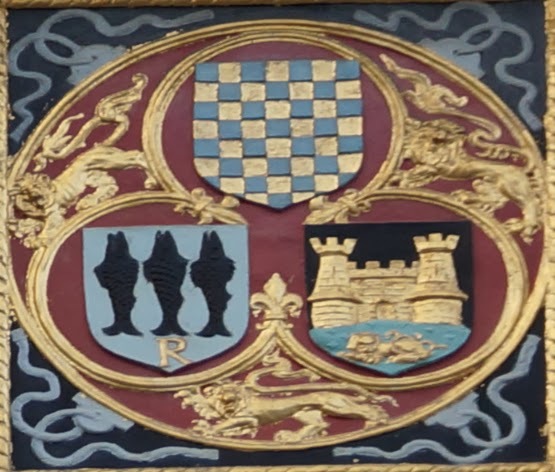 The gold-and-blue checks belonged to the Warrennes, Earls of Surrey, and have been adopted in the county in various heraldic contexts; the castle and lion can be found on Guildford's coat of arms; but the three fish have proved elusive!